Summer in New England is always much too short. With just a few months of warm, sunny weather each year, us locals are inclined to make the most of it. For many of our clients, that means installing a home pool. It can be a laborious (not to mention costly) addition, but a well-designed pool area offers plenty of fun for kids and adults alike. As we move closer and closer to Fall, we’ve decided to look back on some of our all-time favorite designs. When it comes to constructing or renovating a home, location is one of our major sources of inspiration. And here in New England there’s plenty to inspire: from the dreamy seacoast to peaceful lakes to idyllic pastures. Often this is expressed on a large scale — through natural stone terraces, shingle-style siding or grand entryway columns — though we love to luxuriate in the details, too! 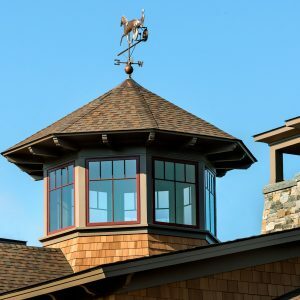 Cupolas and weathervanes are classic elements of a New England home, and we like to incorporate them into our designs whenever possible.